Hoppy Dance released to test! Author John Rehg has released We do the Hoppy Dance, a children’s book, using HP MagCloud (now part of Blurb), as a test of their printing a saddle-stitched product. You can buy it here. This includes a free iPad download! 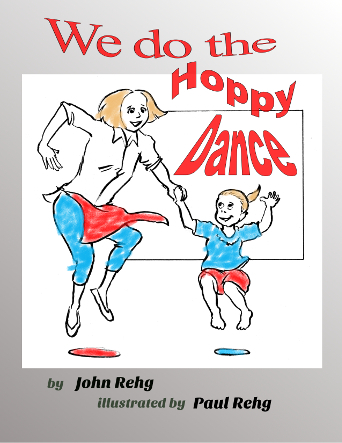 This book breaks new ground for the author, and combines a children’s book with a coloring book, illustrated by his brother, graphic artist Paul Rehg. When you look at many children’s books today, they promote what they are trying to teach the children. The author has felt that some of these ‘lessons’ are made too obvious, and wonders if a more subtle approach might engage the child and teach them without preaching to them. Additional versions will be released in the near future. *These statements by the author have not been evaluated by any government organization, nor any organization, educational or otherwise, that might provide such research. They are only statements by the author to sell the book.